Greg Verdino: The 7 strands of "blog DNA"
The 7 strands of "blog DNA"
Recently, I was working with some of my fellow crayonistas on a blogging strategy for a client and we put together this simple graphic that presents the 7 Strands of Blog DNA - the key elements that, when combined in a unique way, make any given blog what it is. Original, compelling and unlike anything else on the web. VOICE: It's what you say and how you say it. Voice is your blog's unique, distinctive narrative style that draws readers in and keeps them coming back. TEXTURE: This trait refers to the unique combination of multimedia elements that give your blog a distinctive look and feel that complements the unique sound of your voice. Texture speaks to if and how you use audio or video, illustrations or photos to dress up your posts. IMMEDIACY: This is a measure of recency and frequency. Immediacy is the element that keeps your blog feeling fresh and timely. CONVERSATION: This is the element of dialogue, the degree to which you provide the reason and the means for people to talk back to you, and to what extent do you engage directly with your readers? Lots of people argue that a blog isn't a blog without conversation, but we can also point to at least a few high profile blogs that aren't conversational at all. CONNECTIVITY: This speaks to the ways in which you participate in the community at large. It's your blogroll, the way you use links and trackbacks, the extent to which you comment on other people's blogs or even participate in blogger events and social networking activities. ACCESSIBILITY: The extent to which you make it easy for readers to access your blog's content -- feeds, email subscriptions, widgets, syndication and more. VISIBILITY: Tags, key word-rich headlines and posts, and automated search and directory pings. This is about making sure people find your blog and your most relevant content whenever they're looking for information on a topic you cover, whether they're using Technorati, Google or any other search engine to find it. 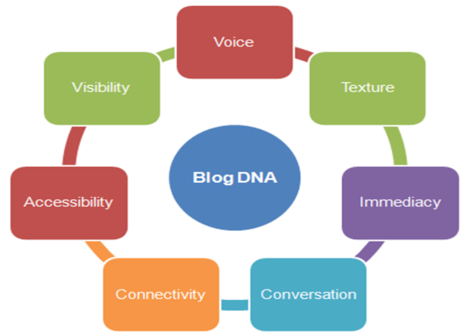 So, what's your blog's DNA? (Or the DNA of your favorite blog, if you don't write one yourself?) How do you combine these 7 traits to produce something that is uniquely yours and that keeps your readers coming back for more? I'd also love to hear your comments -- and hope I can refine the framework based on your thoughts. Does this work for you? Did I miss anything? Get anything wrong? Chime in. Can Mass Media Moguls Become Micromavens? CMO on You can b(2b) a microMARKETER too. Your Social Media Marketing Consultant on You can b(2b) a microMARKETER too. Neil Ashworth (Network Marketing Online) on You can b(2b) a microMARKETER too. cmo conversations on Want to make authentic connections? 18 experts tell you how in a free e-book. Connor Keating on You can b(2b) a microMARKETER too. tom (Watkins products Asssociate) on You can b(2b) a microMARKETER too. Dan on You can b(2b) a microMARKETER too. Jake on You can b(2b) a microMARKETER too. 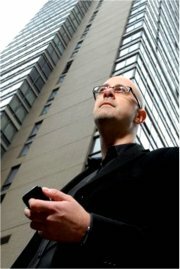 Greg Verdino is a futurist, writer, speaker, and strategist. 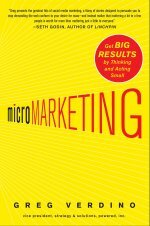 His first book, microMARKETING, was published by McGraw-Hill in summer 2010.